SNK Playmore has announced its partnership with Atlus to bring The King of Fighters XIV to the Americas later this year. No announcement for Europe at the moment. New trailer and screens showing Kukri and Mui Mui inside. THE KING OF FIGHTERS XIV will be making their stateside debut thanks to a partnership between SNK PLAYMORE and Atlus U.S.A. The vaunted fighting game series, which first made its debut 1994, is entering a new evolution with THE KING OF FIGHTERS XIV thanks to series-first 3D graphics and debuting exclusively on the PlayStation 4 console. THE KING OF FIGHTERS XIV will arrive to consoles later in 2016. THE KING OF FIGHTERS legacy will be unchanged in KOF XIV; the traditional 3 vs. 3 battle system is still there, with an expansive roster of 50 characters, all of whom are available in-game at launch. But the evolutionary changes in the game start with the creation of all the game's assets with 3D graphics. There's been some meticulous refinement to the game's fighting engine to be more streamlined and approachable for newcomers. There are also notable improvements made to the "Combo" and "MAX Mode" game mechanics, and the "RUSH" feature, which adds simplified combo inputs for novices. Brand new in THE KING OF FIGHTERS XIV is the innovative "Party Battle" feature which pits two teams of three human players each against each other in a cooperative team fight in online play. There's also a new online training mode that will connect beginners and experienced players for tutoring on how to play together. 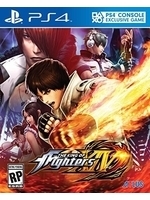 • Revamped Online Experience: THE KING OF FIGHTERS XIV has devoted a lot of development time to improving the game's netcode for vastly improved online gameplay. KOF XIV uses the PS4's online architecture to have a whole host of online conveniences, from spectating to saving replay/battle data, and having a single online KOF XIV profile to connect with friends. THE KING OF FIGHTERS XIV is a PlayStation 4 exclusive debuting later this year. Atlus U.S.A. will publish the game in the Americas, and there will be more information to come later. The official website for the game is www.atlus.com/kofxiv. The game is not yet rated by the ESRB. So they went for 3D too? KoF XIII was visually thousand times better. Yea.. they're trying to make up for it by having a 50 character roster. If it plays great I might be okay with it looking like crap. Better than no KOF at all. SNK is awesome. KOFXIII is definitely a beautiful game. it looks so bad visually. like an upres'd PS2 game. The graphics are cringe worthy, but the 50 characters roster makes it worth it.